If you’ve been here before, you know it can get super-hot during the summer months in Mallorca. 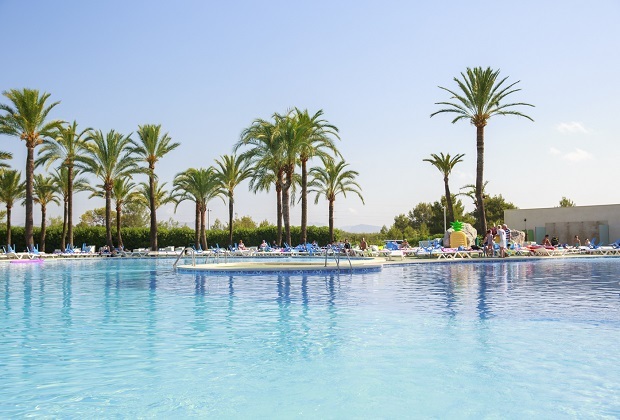 Alcudia is usually hottest in August, with average temperatures of 25 degrees Celsius. Last year, we experienced the same heatwave as the rest of Europe and some days the temperature reached into the upper 30s. That’s why it’s important to take it easy in the sun for maximum fun on holiday. Average temperatures in May and October reach about 18 degrees Celsius, with June to August hovering between 22 and 25 as a rule. However, just as we had a heatwave in 2018, we could experience it again this year. No-one wants to get sunburn when they’re busy having fun, so we’ve introduced more poolside shade this year. 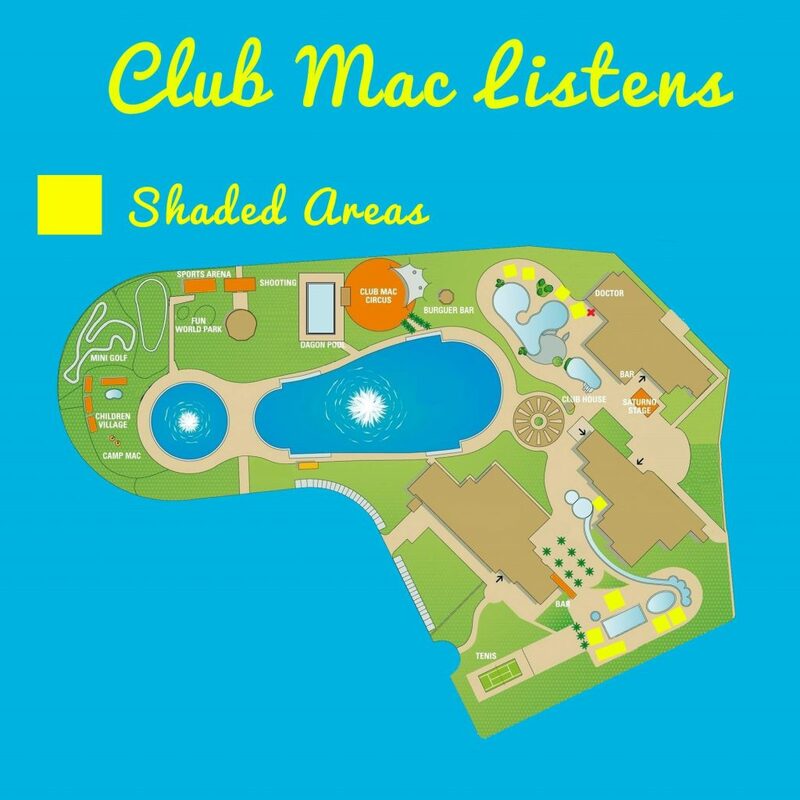 You can see from the plan below, that the areas with extra shade are next to our swimming pools, so you can lie in the sun without getting burned. There are also parasols all around the Dragon splash pool, ideal to keep the kids out of the hot sun. We know it’s tempting to eat lots at our delicious All-inclusive restaurants, but if you keep your plates small you’ll keep your temperature down. That’s why when you’re very hot, you don’t always fancy eating big meals. The bigger your portion, the more your body heats up to aid digestion, so if you snack little and often, you’ll be cooler overall. It’s so tempting to jump into a cold shower when your skin is overheated but resist the urge and go for a lukewarm wash after a day in the sun. This is because cold water automatically closes your pores, meaning your core temperature stays higher for longer. A lukewarm shower will bring your core body temperature down and you’ll feel more comfortable in no time. It sounds so simple, but if you aren’t drinking enough water along with your all-inclusive cocktails, you might regret it. Keep a cold glass of water on standby and match with any alcohol you’re drinking. Too much of the latter can lead to feeling quite poorly in the hot sun, and it’s not worth the risk of ruining your holiday. You may not fancy a swim, but if you dip your feet in the water, you’ll instantly feel cooler. Our bodies have various ‘quick-cooling’ areas, including the neck, wrists and feet. If you don’t want to sit with your feet in the pool, drape a wet towel on your neck or run cold water over your wrists. You’ll feel cooler straight away. Use a high factor sunscreen on the whole family and reapply regularly throughout the day. Even if the brand boasts of ’24-hour protection’, it’s safest to reapply often during the day, particularly if you’re in and out of the water.